Annie Thomas, would you like to drive the #24 for Red Stallion? ooc: Jerry Harvick? is he real?! I would like to offer Vicente Benítez a ride on Blue Flare Autosports! Englishman Ben Thompson will drive the #4 for Ravenwest Motors. Edited Vaillier's nationality, he is Spanish not Italian! @Fitzwater Was this a yes? Would you like to drive for Skullcandy Sweden Ferrari? Would Cicarelli Berakated like to drive for BFM? Elite Driver Nick Pericles decides to stay with Elites to get a contract, mean while Sowman states:" I really want to come-back this season! I hope Blue Flare will let me back in!" As BFM recently got the email that Sowman would be returning to Formula Alpha they immediately offered him a contract. They do hope he will except the contract! They haven't got a reply back from Barakated so they don't know about him yet. Soon as he got the email, Sowman replies and takes the offer! Hiroki Kazi is still looking into Blue Flare, and maybe Red Stallion Racing. Sowman:" Can't wait to get back in that ride! I hope I can grab the #30 car as it is the closest number to the #31!" The son of Randy and Samantha McBlair has announced on Twitter that he will be a free agent for Formula Alpha S2. He is looking into Blue Flare or Red Stallion. McBlair stated: "I will be aiming for those teams because they seem like midpack teams. Don't get me wrong, I love both teams but truthly both teams seem like midpack teams. But with the new engines they are equipping things might change..."
Mr. Mart recently stated that he is hoping to acquire Mr. McBlair, " I thought what he said about Mid-pack teams, we wouldn't hire a guy who has the audacity to say this but, his sass could show me the style he drives. And I like it. So I'm offering McBlair a 2 season Contract." ^Quote from Pericles: "His sass could show me the style he drives. And I like it"
But, now that I think of it... I'd imagine I'm gonna be a midpack team since I was a midpack team last year. But, with my new V12 Vanwall engine I think the car has more horsepower so maybe not. "I took the contract offer into my mind and thought about it. I considered dropping my free agency altogether and going for Elite's or Lite's but I made up my mind. I accept Red Stallion's offer and look forward to the seasons to come. And if I need to I will cut our contract at the end of S2, but that is only if something happens and I need to! Tristian Wilhoit, who is currently driving for Delta in the Winter Season, is looking for a ride this next year, rumors have it that Delta might keep him because of his experience in an open and closed wheel racing. Wilhoit is also going to be a part time driver in the AES. Regulations state that Formula Alpha competitors cannot compete in AES FULL TIME. Since Wilhoit knew that, he will be only running the road courses of this next season while competing in Formula Alpha. 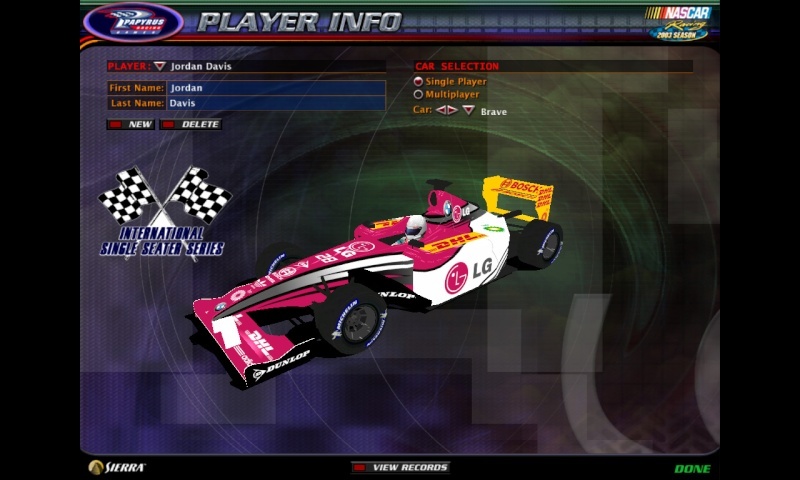 Who knows, he may eventually have his final season in AES or Formula Alpha before he retires from racing completely. Once again, Tristian Wilhoit is looking for a ride JUST IN CASE Delta releases him.